Feed = Food? Do livestock really compete with humans for food? Can we feed up to 10 billion people in 2100 by improving crop yields, reducing deforestation, and reducing meat and dairy consumption? These solutions are among those suggested by Jonathan Foley at the University of Minnesota’s Institute of the Environment to enable the increase in food production required by the future global population. These are logical suggestions, yet the proposal that meat and dairy consumption should be reduced is likely to be the most-debated, particularly as livestock industry stakeholders may regard this as yet another attack on animal agriculture. Based on those data, Foley’s conclusion is entirely logical. However, as Carl Sagan said, “Extraordinary claims require extraordinary evidence” – and here the evidence is lacking. A recent review of feed efficiency by Wilkinson reports that monogastric animals require 4.0 kg (swine) or 2.3 kg (poultry) of feed per kg of gain. Monogastrics are indeed considerably more efficient than their ruminant counterparts as beef animals require 8.8 kg feed per kg gain – considerably more than swine or poultry, but far less than Foley’s estimate. It would be convenient to argue that the errors in Foley’s feed efficiency data (not to mention religious limitations on pork consumption) negate the report’s conclusions. But isn’t it logical to argue that we should eat meat produced in systems that use fewer resources to produce animal protein? Personally, I spend more than half my time traveling to present precisely that message to the animal industry and to encourage livestock producers to improve efficiency. I absolutely believe that we need to improve productivity and efficiency in order to feed the growing population. However, traditional feed efficiency data have a major flaw – it’s assumed that all animal feed could otherwise be used to feed humans. Wilkinson suggests that the traditional concept of feed efficiency be re-examined to reflect the quantity of human-edible crop inputs that are used to produce a unit of energy or protein from animal products. For example, humans cannot digest pasture, only 20% of the nutritional value of oilseed meals can be utilized for human food and yet 80% of nutrients within cereals, pulses and soybean meal are human-edible. 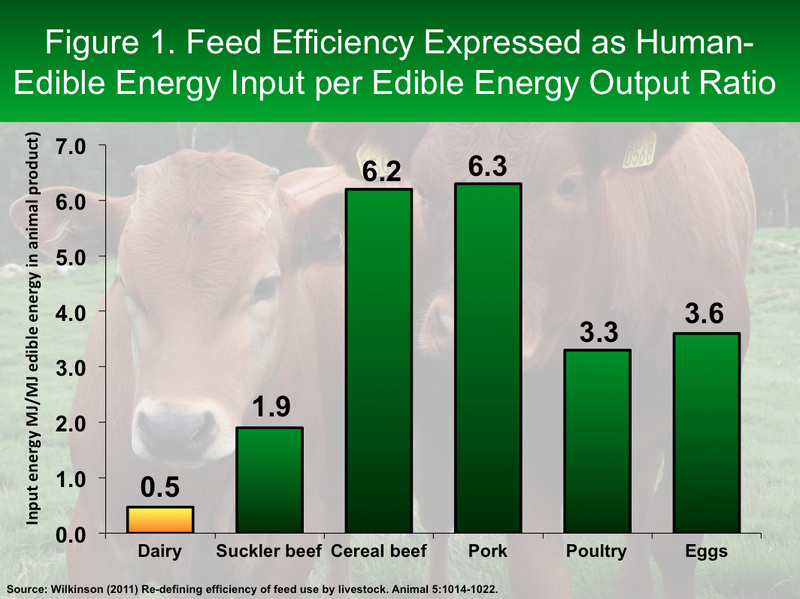 By partitioning out the human-edible component of animal feed, Wilkinson demonstrates that the human-edible energy feed efficiency ratios for pork and cereal beef are similar (Figure 1*) and that dairy production actually produces twice the amount of human-edible energy than it uses (input:output ratio of 0.5). 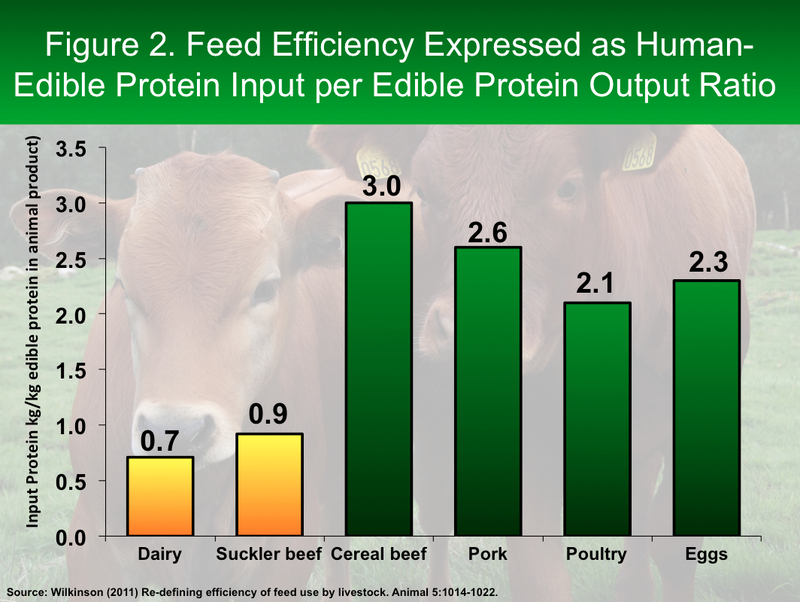 On a protein basis, cereal beef has a higher human-edible protein feed efficiency ratio (3.0) than pork (2.6), but suckler beef systems where cattle are grazed on pasture again produce more human-edible protein than they consume (input:output ratio of 0.9, Figure 2*). Not only are these revised feed efficiency estimates considerably lower than those quoted by Foley, but they underline the importance of herbivorous grazing animals in utilizing human-inedible forage to produce animal protein. Numbers have power – it’s always tempting to base a suggestion around a single data point that “proves” the argument. Feed efficiency is a useful metric, but as we face an ever-increasing challenge in balancing food demand, resource availability and consumer expectations, it’s critical that we examine the bigger picture. The ruminant animal has a major evolutionary advantage in its ability to digest forages – we may be better acquainted with the human dietary advantages of probiotic bacteria than our ancestors, but until we are equipped with human rumens (humens?) we cannot hope to effectively make use of all crop resources. *The importance of acknowledging the human-edible component of feed efficiency was part of my presentation at the Alltech Ruminant Solutions Seminar in Ireland this week – to go to a PDF copy of my presentation please click here. This entry was posted in Beef, Dairy, Effiency, Feed, Global population, Meatless Mondays and tagged Beef, Corn, Dairy, Environmental Impact, Environmental Working Group, Feed Efficiency, Meatless Mondays, Monogastric, Ruminant, Swine. Bookmark the permalink. Do you know what percentage of feed is grown on land that would be suitable for growing food? Or what percentage of pasture would be suitable for growing vegetables? That’s a great question. In terms of growing feed on land that could be used for food, there’s little data out there. This is for two reasons, firstly, nobody (as far as I know) has investigated it and secondly, it’s slightly misleading as a lot of by-products from human food are used as animal feed (almond hulls, apple pomace, citrus pulp etc) so it can sometimes be difficult to draw the line between human and animal feed. 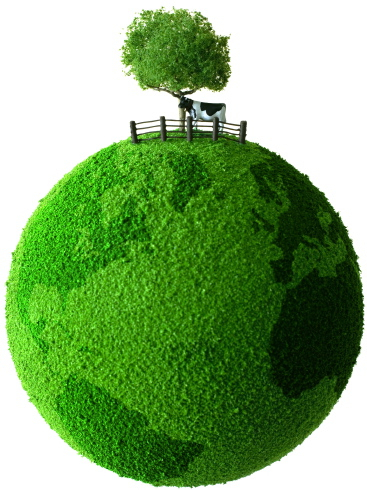 However, according to USDA only 8% of pasture in the US is productive enough to be classified as cropland pasture, suggesting that unless land management was radically changed (bearing in mind that any tillage would ironically result in a loss of sequestered carbon), 92% of pasture land can’t be used for growing food/veg. That’s fairly logical when we consider than 95% of pasture land in the US is used for beef production and that pasture tends to be of relatively low quality. You should also take into consideration that much of the land used for pasture to feed cattle, goats and sheep should not be cropped because of the degree of slope. To till that land would lead to massive erosion. Grasses will also grow at higher altitudes and latitudes than will more common food crops. Reindeer, goats and elk can produce meat where few food plants can grow. Many other acres are pastured because of lack of water. Fruits and veggies favored by humans usually need much more water than pasture plants. Ruminates eat many things, and can produce energy from them, that a non-ruminant would get nothing out of. In corn country, cattle are fed huge amounts of corn stalks, cobs and husks. These products are high in cellulose and very low in energy, yet cattle not only survive on them, they thrive. For those who wish to have us stop eating meat products, I ask, Then what becomes of all the animals? If farmers do not have a financial incentive to keep these animals, who will keep them, and what will they eat? So true Michael! I firmly believe that everybody should have a choice as to what to eat, but it we move to a vegetarian or vegan agenda, surely that renders cattle, sheep, swine etc to zoos or national parks within a short space of time. Not to mention the impact on by-products from animal agriculture: leather, pharmaceuticals, fertiliser etc. It’s definitely not as simple an equation as the “let us all eat less meat” propounders would have us believe. One other area that I’ve not seen discussed within this arguement, especially the conversion of pastureland or cropland used to produce animal feeds to vegetable growing is the added labor requirement that is necessary. Vegetable production is more labor intensive than these production porgrams. It also would lend itself to contributing to the immigration debate. Couldn’t agree more Steve. Discussed it further in this paper: http://animalfrontiers.fass.org/content/1/1/26.full.pdf+html. Michael Pollan’s ideas of a a “sun food” production system that doesn’t rely on fossil fuels and uses manual labor and small farms is a beautiful utopia, but is the entire unemployed section of the population going to work on farms to achieve it?